As I read the book, though, instead of becoming more invested, I felt like I was being pushed away. At first, I thought that this book was not for me; instead, that it was written for the author as a testimony to the great work that his nonprofit, Taproot, has accomplished. As you learn in the book, Taproot is an established organization that provides professionals an outlet for pro bono work. However, the more I reread the book, the more I realized that I had originally missed the point. “The Purpose Economy” has many great ideas that can be used to jumpstart purpose in your own life and career. Each chapter is full of stories of companies and individuals who have sought out their purpose and found success, both in their career and lives (with a focus on how Taproot overcame its challenges). Hurst invites the reader to do the same through an update to the concept of “learning, earning, and returning” (which was originally explained as something that happens over a lifetime). Instead, Hurst encourages the reader to do all three simultaneously: to always be learning, which allows one to earn more, while at the same time taking care of the people in our communities through becoming a purpose-focused organization, volunteering, or helping in some way that ties into their unique who, how, and why. 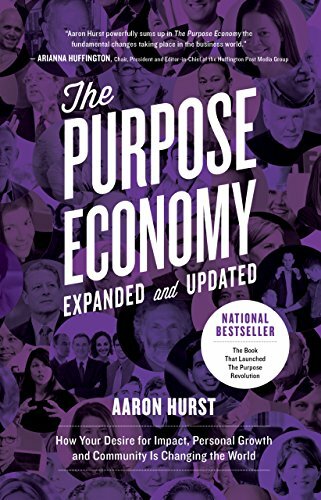 Overall, the stories in “The Purpose Economy” by Aaron Hurst are interesting and the comics unique (I had never seen anything like that in this type of book before) and I have to admit that (like Hurst mentions) purpose is not generally revealed in an instant, but over a lifetime of trial and error. In the end, though, this book shows why an organization like Taproot works: it is a work of passion. I believe his final sentence says it all: “I realized that in founding Taproot, I had found myself” (232). It is only when we find our purpose that we ever really know ourselves.